Entity Framework Code-First is the coolest thing since sliced bread, Windows Phone is the hottest thing since Tickle-Me-Elmo and oData is just too great to ignore. As part of the Full Stack project, we wanted to put them together, which turns out to be pretty easy… once you know how. EF Code-First CTP5 is available now and there should be very few breaking changes in the release edition, which is due early in 2011. Note: EF Code-First evolved rapidly and many of the existing documents and blog posts which were written with earlier versions, may now be obsolete or at least misleading. With traditional Entity Framework you start with a database and from that you generate “entities” – classes that bridge between the relational database and your object oriented program. With Code-First (Magic-Unicorn) (see Hanselman’s write up and this later write up by Scott Guthrie) the Entity Framework looks at classes you created and says “if I had created these classes, the database would have to have looked like this…” and creates the database for you! By deriving your entity collections from DbSet and exposing them via a class that derives from DbContext, you “turn on” database backing for your POCO with a minimum of code and no hidden designer or configuration files. Your entity objects can be used throughout your applications – in web applications, console applications, Silverlight and Windows Phone applications, etc. In our case, we’ll want to read and update data from a Windows Phone client application, so we’ll expose the entities through a DataService and hook the Windows Phone client application to that data via proxies. Piece of Pie. Easy as cake. To see this at work, we’ll create an ASP.NET/MVC application which will act as the host for our Data Service. We’ll create an incredibly simple data layer using EF Code-First on top of SQLCE4 and we’ll expose the data in a WCF Data Service using the oData protocol. Our Windows Phone 7 client will instantiate the data context via a URI and load the data asynchronously. Create a new application of type ASP.NET MVC 3 and name it DeadSimpleServer. We need to add the latest SQLCE4 and Entity Framework Code First CTP’s to our project. Fortunately, NuGet makes that really easy. Open the Package Manager Console (View / Other Windows / Package Manager Console) and type in “Install-Package EFCodeFirst.SqlServerCompact” at the PM> command prompt. Since NuGet handles dependencies for you, you’ll see that it installs everything you need to use Entity Framework Code First in your project. You are downloading SQLCE from Microsoft, the license agreement to which is available at http://173.203.67.148/licenses/SQLCE/EULA_ENU.rtf. Check the package for additional dependencies, which may come with their own license agreement(s). Your use of the package and dependencies constitutes your acceptance of their license agreements. If you do not accept the license agreement(s), then delete the relevant components from your device. You are downloading EFCodeFirst from Microsoft, the license agreement to which is available at http://go.microsoft.com/fwlink/?LinkID=206497. Check the package for additional dependencies, which may come with their own license agreement(s). Your use of the package and dependencies constitutes your acceptance of their license agreements. If you do not accept the license agreement(s), then delete the relevant components from your device. You are downloading EFCodeFirst.SqlServerCompact from Microsoft, the license agreement to which is available at http://173.203.67.148/licenses/SQLCE/EULA_ENU.rtf. Check the package for additional dependencies, which may come with their own license agreement(s). Your use of the package and dependencies constitutes your acceptance of their license agreements. If you do not accept the license agreement(s), then delete the relevant components from your device. Note: We’re using SQLCE 4 with Entity Framework here because they work really well together from a development scenario, but you can of course use Entity Framework Code First with other databases supported by Entity framework. Notice that the entity class Person has no special interfaces or base class. There’s nothing special needed to make it work – it’s just a POCO. The context we’ll use to access the entities in the application is called PersonContext, but you could name it anything you wanted. The important thing is that it inherits DbContext and contains one or more DbSet which holds our entity collections. Now our database and entity framework are set up, so we can expose data via WCF Data Services. Note: This is a bare-bones implementation with no administration screens. If you’d like to see how those are added, check out The Full Stack screencast series. Add a new WCF Data Service to the project (right-click the project / Add New Item / Web / WCF Data Service). We’ll be exposing all the data as read/write. Remember to reconfigure to control and minimize access as appropriate for your own application. Open the code behind for your service. In our case, the service was called PersonTestDataService.svc so the code behind class file is PersonTestDataService.svc.cs. We’re enabling a few additional settings to make it easier to debug if you run into trouble. The ServiceBehavior attribute is set to include exception details in faults, and we’re using verbose errors. You can remove both of these when your service is working, as your public production service shouldn’t be revealing exception information. Let’s recap what we’ve done so far. But enough with services and XML – let’s get this into our Windows Phone client application. /uri – This will point to the service URI. In this case, it’s http://localhost:59342/PersonTestDataService.svc Pick up the port number from your running server (e.g., the server formerly known as Cassini). /out – This is the DataServiceContext class that will be generated. You can name it whatever you’d like. /DataServiceCollection – Include this flag to generate collections derived from the DataServiceCollection base, which brings in all the ObservableCollection goodness that handles your INotifyPropertyChanged events for you. Copyright (C) 2008 Microsoft Corporation. This produced the file ContactService.cs in the WhoIsThatPhone directory. Create a new application of type Windows Phone Databound Application. In the code-behind you’ll first declare a member variable to hold the context from the Entity Framework. This is named using convention over configuration. Note that this method runs asynchronously and when it is finished the people collection is already populated. Thus, since we didn’t need or want to override any of the behavior we don’t implement the LoadCompleted. This entry was posted in Data, Essentials, Full Stack, Mini-Tutorial, Patterns & Skills, Tools and Utilities and tagged Mini-Tutorial, wp7Tutorial. Bookmark the permalink. You’ll say thanks to this particular assistance at a later time. You also have to prepare questions that are asked in the right way, nothing too offensive and nothing too personal. a look when I get home. I’m amazed at how quick your blog loaded on my mobile .. I’m not even using WIFI, just 3G . Jesse’s right in his disclaimer about EF Code first and SQL CE changing since he first wrote this. In this case you’ll want to change the code from ‘MotorcycleContext’ to ‘PersonContext’, as well as change ‘DbDatabase’ to ‘Database’ since that class name changed after the CTP. In addition, change the ‘using System.Data.Entity.Database’ line at top to read ‘System.Data.Entity’, another post-CTP change. Strange, but I can’t download the sample code from Jon Galloway’s skydrive site– I can see the zip file but can’t download it. Skydrive doesn’t give any errors but the file won’t come down. I’ve tried it on a couple of different computers. Calling DataSvcUtil.exe generates the ContractService.cs file as described, but make sure you add it to the windows phone project and not the ASP.Net MVC project– I made that mistake. Also, the Windows Phone project will need to have a reference added to the System.Data.Service.Client assembly in order to work with the ContractService.cs file. Finally, Microsoft changed the game with regard to the assembly name the DataServiceCollection class lives. It’s now in the System.Data.Service.Client assembly, and not System.Data.Service.Common, as in the MainPage.xaml.cs example code. See http://social.microsoft.com/Forums/is/crm/thread/0831be0c-64e8-4bd3-a473-7317e98271e7 for more info on that one. I feel like a heel, with all these replies. My apologies but I forgot to add something to the post above. This is very big help! Our next step in the Full Stack (after we make a video covering this material) is to apply these approaches to our full featured application. I’ll let you know . Any chance of a follow up of security and validation? 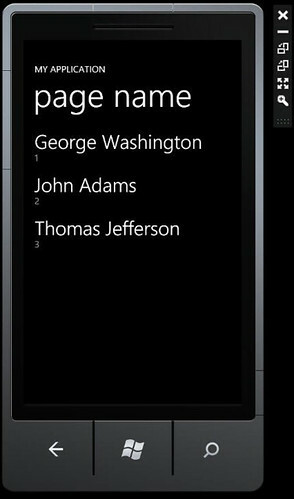 Great tutorial on EF, OData, and WP7. I’ve written a few OData services as samples and it seems TOO easy. Is the technology really that simple use in production code? I know that permissions and security needs to be considered when exposing OData. I’m just wondering if there are other powerful features to exploit that may be nestled away in a book or some tutorials somewhere.